Our buildings are founded on a premise of strength and integrity and the same can be said of our people: Lots of hard work, time and dedication goes into crafting beautiful garden rooms that we hope our clients will love. 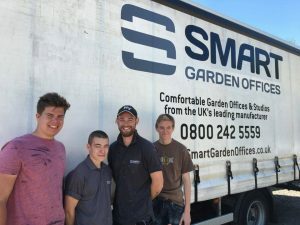 We ultimately believe in instilling that dedication in our team of craftsmen, women and professionals from the outset of their time at Smart, with a commitment to do so into our future. This includes our continuous investment in training and development opportunities, including the use of the latest precision CAD technology in the design and manufacture of our garden buildings. In order to equip and prepare our team for the future of British manufacturing, the latest innovations in design technology and craftsmanship, and the skills to be effective managers as we continue to grow as a business we are proud to have launched the Smart Academy. The academy is our commitment to training the future generation of skilled craftsmen and women and developing our broad range of professionals’ skills too. To date in 2016 we have made a commitment to provide team manager training for eight members of the team and have employed eight carpentry apprentices who are learning a skilled trade at Smart, while studying with West Suffolk College to achieve their apprenticeship qualification. I am incredibly grateful for the opportunities that I have received at Smart. I have grown as a person, taken on new responsibilities and I’m learning a trade for life.